Example: Eliminate negative exponents and simplify (3x8y-6)(-5x-4y6). Problems: Eliminate negative exponents and simplify. A word of warning! , not . so that no fraction appears under a radical sign and no radical appears in a denominator. This "rationalizing the denominator"
is accomplished in several ways, as illustrated in the following examples. 98. Rationalize the denominator in . 99. Rationalize the denominator in . 100. Rationalize the denominator in . 101. Rationalize the denominator in . process may introduce extraneous roots. Potential solutions must be checked in the original equation. Thus, x = 20 is a possible solution. Checking in the original equation we find . Thus x = 20 is the solution. Thus, x = 2 is a possible solution. square root!) Thus, x = 2 is not a solution. This equation has no solution. 16y2 - 48y + 36 = 36y + 108.
so y = -3/4 or 6.
is not. 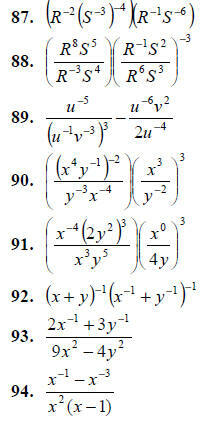 The only solution is y = 6.
functions including functions like , .